Ben Mills, owner and brewer of Fossil Cove Brewing in Fayetteville, Arkansas, is shooting for a first in his region: a commercially-brewed sour beer that is designed to be sour from the beginning. There has been at least one sour beer sold locally that was the result of unintentional introduction of souring organisms. That’s not the case here. Ben’s beer is literally tart from the start. 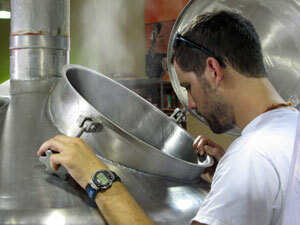 Ben Mills checks the boil of his sour beer. If you’ve read Chris Colby’s article on sour brewing and sanitization, you’ll know that letting beers sour in the fermenter is seen as a risky proposition. If you don’t remove the souring “bugs” completely from the fermentation vessel and everything that has been in contact with the sour beer, you run the risk of souring any beer that the equipment touches afterwards. The approach Ben has taken with his sour beer is designed to avoid that risk. Instead of souring after the boil, Ben has soured his beer before the boil — in the mash tun. The beer is based on one of my recipes seen on Basic Brewing Video. Following an interview with homebrewer Sean Coates on Basic Brewing Radio, I decided to inoculate a mash with Lactobacillus and let it sour over a few days. Then, boiling the wort taken from the sour mash would kill the souring bacteria before putting the wort into the fermenter. The sour mashing process doesn’t seem to worry Ben. He’s not concerned that the sour mash will ruin his mash tun. “We’re always putting Lactobacillus in there because we’re always putting grain in there,” he says. And being stainless steel, the tun can be thoroughly cleaned afterwards. Here’s how the process goes: perform a standard mash to convert the starches of the grain into sugars. Then, cool the mash to a temperature hospitable to Lactobacillus bacteria. Inoculate the mash with the souring bugs and hold at a temperature that will keep them happy for a few days. Collect the wort from the mash and boil to sanitize the wort and isomerize hops. Chill and ferment as you would a typical beer. Ben and his sour mash tun. Since Ben is stepping up my original two-gallon (~ 8 L) recipe into a two-barrel recipe, there are a few differences. To cool the mash in my small enamel pot, I added four quarts (3.8 L) of cool water. 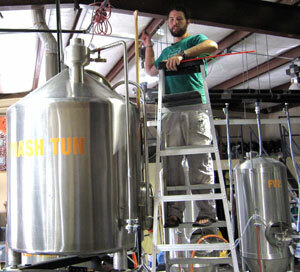 Ben added a combination of ice and filtered tap water to his five-barrel mash tun. To maintain the temperature of my mash over 72 hours as the mash soured, I put my small kettle into my electric smoker and set the temperature to 110˚F (43˚C). Ben had to rely on the ambient heat in his non-air-conditioned brewery, which can get pretty toasty in an Arkansas July. To collect the wort, I poured my mash into a nylon mesh bag and pulled the spent grain out using the brew in a bag technique. Ben performed a more traditional lauter and sparge into his kettle from his mash tun. The sour mash itself can be pretty unpleasant. After all, you’re intentionally spoiling grain. Twenty-four hours after starting the process, my little sour mash smelled like a nasty dumpster. Forty-eight hours in, a pellicle had formed across the top, but the nasty smell had subsided, being replaced by a bit of tartness. By 72 hours, the aroma was much more clean and sour. A pellicle on the mash. In this case, a good thing. Ben began his sour mash at 120˚F (49˚C) on a Friday. By Monday, the temperature had fallen to 95˚F (35˚C). According to Ben’s research, this still fell within the comfort zone for the souring bacteria. The mash tun was topped off occasionally with CO2 during the sour mash to inhibit activity of aerobic bacteria, especially Acetobacter, which converts alcohol into acetic acid (the active ingredient in vinegar) in the presence of oxygen. Lactobacillus ferments without oxygen. Saturday, samples from the mash had already achieved sourness. Sunday, a vegetal flavor and aroma had joined the party — perhaps an indication of dimethyl sulphate (DMS). Monday, Ben made the decision to lengthen the boil time in my recipe of only fifteen minutes to a full hour to help eliminate the DMS character before putting the wort into the fermenter. And that’s where the beer currently resides. Ben pitched Safale US 05 — a very clean fermenting yeast. 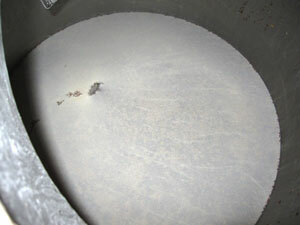 The wort going into the fermenter had been scrubbed clean of the DMS character by the longer boil. It’s now up to the yeast (and time) to turn the beer into a tasty, tart summer brew . . . we hope. This is, after all, an experiment. It’s a technique that’s not feasible for most commercial breweries. However, the sour mash fit well into Ben’s schedule over a weekend when he likely wouldn’t have been brewing, anyway. In my case, it turned out very well on the small scale (see recipe below). Ben’s batch is much larger, but for him it’s still fairly small scale. He’s invested 56 pounds (25.4 kg) of pale malt, 16 pounds (7.25 kg) of malted wheat, 10 pounds (4.5 kg) of malted rye, and 4.4 oz. (125 g) of aged Mount Hood hops. Plus, five pounds (2.27 kg) of pale ale malt for inoculation and enough yeast to get the job done. Stay tuned. Heat 6 quarts (5.6 L) filtered water to 160˚F (71˚C). Add grain (except for two-row for inoculation) to bring to a mash temperature of around 151˚F (66˚C). Hold for one hour. After mash rest, add cool water to bring the mash temperature to 120˚F (49˚C). I added about four quarts (four liters). Add the two-row for inoculation and stir. Top off with CO2 or put a layer of plastic wrap on the mash surface to keep oxygen out. Maintain the temperature of the sour mash for 72 hours. I set my electric smoker to 110˚F (43˚C), and that seemed to work well. A previous batch had been held for 50 hours, and there was a hint of “dumpster” on the nose of the finished beer when compared to the much cleaner 72-hour version. After the sour mash rest is complete, empty the mash tun into a kettle lined with a nylon Brew in a Bag (BIAB) bag. Remove the grain and squeeze the bag. (Don’t be afraid.) Bring the wort to a boil, add hops and boil for 15 minutes. Chill and pitch as normal. I fermented the beer in a plastic Mr. Beer fermenter. I bottled, priming each bottle with priming tablets. I just did a copy of your process last night! Instead of using your grain bill, I had a 1 gallon malt mix from Brooklyn Brew Shop lying around that I got on special and hadn’t used yet. It was for a belgian blonde ale so should be OK for this style of recipe. I don’t have CO2 so just put some plastic over the surface and closed the lid tight. My kettle with the mash is sitting on a heating pad and holding at about 37C to 40C. Will hopefully do the boil etc.. on Thursday. Keep us posted as to how this one turns out! Will do. Please let us know how yours goes! What method did you use to maintain the 110 degree temp for 3 days? I don’t have an electric smoker, but I do have a hot shed. For my home batch, the smoker worked perfectly. In the brewery, Ben had to rely on ambient temp. Over 72 hours, it fell from 120 to 95. I was surprised that you tasted the wort after the sour mash – it seems like the warm, moist environment is ideal for growth of bacteria that are not particularly healthy to consume. Is the low pH sufficient on its own to prevent the replication of pathogens in the mash? It might have been risky, but the wort soured very quickly, indicating a lower pH. Also, the mash was flooded with CO2. I don’t know if this adds to the safety. I’m using a reptile heating mat underneath my pot. I checked it last night and it didn’t smell much and there was no pellicle (small mason jar experiments I have done had pellicles within 24 hours). I was worried that I maybe pitched the grain too warm so I pitched in some more. This morning it was looking and smelling how it should. Will leave it to tomorrow afternoon to finish up. Hopefully it turns out OK. Thanks for the update. Remember that my 72 hour version was a bit cleaner than my 50 hour beer. You might not want to be in too much of a hurry. On a side not, you guys should look at enabling email subscription to comments. There should be a plugin available or a setting in your WordPress control panel. We are planning a family vacation through Arkansas in August. We plan on dropping by Fossil Cove and the other 5-6 breweries ya’ll have there (pretty amazing actually). Hopefully he will have this ready to taste. Pretty cool for him to take the risk. I hope it’s ready and tasty by then. We’ve got a lot of good local beer around here now. Cheers! How long does it take to go from grain to glass with this method? Other than the extended time for the sour mash, the brewing process is the same as standard brews. In this case, about two weeks. Interesting stuff, I might actually give this a go sometime. From the homebrew perspective, having a large and a small mash tun, I’m guessing it would be possible to conduct a small Sour mash 72 hours before mashing a larger regular mash then combining the resultant run-off & sparges for the boil. Yes. I have a feeling that partial sour mashing is more common than the full version. We had some wonderful beers at Upright Brewing in Portland, Oregon, that were brewed using this method. Brewday done, its the yeasts job now http://pdtnc.wordpress.com/2013/09/22/ag104-nz-sour-wheat/ fingers crossed! Turned out to be pretty simple, except for the part where I had to convince myself to try the mash. Thanks as always for the inspiration, James!